For the first time in several years, I made all three Easter dresses for myself and my girls! We are planning a photo shoot with theirs on Saturday, but since I had mine on, having just finished the last touches, Natalie took some pictures for me. I actually had not intended to make a new dress, I was going to wear another one I made several months ago, but when this fabric and pattern turned up at just the right time, I finished the girls’ on time and decided to start and see how far I could get! I used New Look 6600 I am in LOVE with this wrap dress! This is the first time I have successfully made a wrapped garment. I only recently started making muslins of everything and it has been soooo good for me to slow down and make alterations to the pattern so that I don’t waste good fabric on things that don’t turn out! Here is what the bodice front pattern piece looked like after I’d made my alterations. This dress would NOT have worked out if I had just cut into my fabric without making a practice dress first and I would have been so sad because I love the fabric so much and wouldn’t have been able to obtain more. A few changes I made: I took a wedge out of that front line to fix some gaping that was happening. A wrap dress should fit close against the body in that front V area, so that it doesn’t gape open. Then for modesty, I changed the line of the front to be higher and give me more coverage. This is a church dress, after all. Then, since I had altered the shape, I didn’t want to draft a new facing. I also took a chunk out of the top of the armhole to cut in more on my shoulders, and the pattern includes sleeve facings also. Instead of recreating all those facings, I just lined the bodice, which turned out beautifully. With my French seams on the skirt, all my raw edges are hidden and it just feels luxurious. Lastly, I included a hand sewn snap in the front where the V comes together. It will never show and it will just hold the bodice where it needs to be so I don’t have to worry about it. What I did NOT change is the length! I love the length of this dress and that we’re moving past the floor length in fashion these days. It’s only supposed to be 58 degrees and rainy on Easter, so I’ll wear my recently made linen jacket over it. I’ll be talking about this jacket in an upcoming post, so stay tuned! I expect to get a lot of wear out of this piece. A few more notes. I got this beautiful rayon fabric at Colorado Fabrics. If you’re even in the Denver area, this is a must-go. I got many beautiful rayons that day because I just cannot find them where I live. Also! If you haven’t seen Easter Parade and you’re into old movies, you should for sure put it on your to-watch list :) It’s one of Natalie’s favorites! I’ll admit, I lost my blogging mojo for a little while. I was still sewing! But I didn’t feel like sharing. Instead of apologizing and explaining, I’ll just jump back in here as if nothing happened and show you something I recently sewed, sound good? I have two daughters who dance and since my other hobby is photography, we really love taking dance photos together. It’s sort of carried us through these ridiculously long winter months. They were wanting some flowy skirts to take photos in, but I didn’t really want to spend the money on yardage, so I dug through my drawer instead and found the costume I wore in a recital in Hawaii when I took an adult ballet class. I don’t have a before photo of it, but the skirt portion had both a lace overlay and a lining. I cut both layers off the bodice and made them into skirts! Lap the ends of the elastic and zig-zig it together so it’s a circle. The skirt opening will be larger than your elastic. Pin the skirt to your elastic, matching your marks. Using a zig zag stitch, sew the skirt onto the elastic, about a half an inch from the bottom of the elastic (see photo below), stretching the elastic to fit. This edge will be on the inside. The outside will look nice and clean. This technique is also useful if you have girls whose dresses get too small or too short. Simply cut off the skirt and attach elastic and give it new life as a skirt! I also went to the thrift store that same day to look for some frugal dance skirts and found this amazing Free People (ahem, expensive) skirt! I paid $5. I also thrifted this purple King size sheet to use as a backdrop. This is probably my favorite shot of the day. I’ve sewn some pretty great pieces lately for myself. Hopefully I can take some photos of those soon and show you! Weekday Sewing & Why I Love Jalie Patterns! I've been parenting solo for about three weeks and have about the same left to go. My mother-in-law visited us this past week, which was an awesome break up of the time Casey's gone. It was nice to have some adult company and we even took a break from school and homeschool co op while she was here, which was also nice. My sewing machine was happy to see me back yesterday, though! I was being a little short on patience with my kids and knew I was craving time alone in my own head and that it would help to put my ear buds in and sew and nicely ask them to not ask any questions of me unless someone was dying, for at least two hours. It worked, I felt a ton better after that and have this AWESOME shirt to show for it! I had the girls snap some pics for me during Kelby's golf lesson today. Sorry to my winter friends who hate me for my palm trees. The pattern is the Jalie hooded tunics and tees. As usual with Jalie patterns, I absolutely love this and will get a ton of use out of it! I bought the pdf and taped. I don't mind the taping process, I think it's kinda fun. The fabric is an amazing French terry from Girl Charlee. After making a dress and a skirt from French Terry recently (which I just realized I haven't blogged about! ), I had to get my hands on some more French terry and I really loved this print. It's actually darker gray than it looks in these photos, more on the charcoal side. This is my second completed project that is on my 2017 Make Nine to-sew list! I do like having that list made, because when I'm looking at what to sew next, it's a good reminder that there are things I really need in my wardrobe and patterns I've been wanting to try. Let me just rave about Jalie's sizing real quick! You cannot beat the accuracy, my measurements fell right into one size AND it's the size that corresponds to my ready to wear size according to their chart! And this top fits me absolutely perfectly. ALSO, their pattern include the sizing for children up to adult, so I can use the same pattern to make my girls some tops without having to purchase another pattern in their size. Awesome. I have plans for another version of this, but long sleeved. Maybe out of this sweatshirt fleece? I also think the tunic length will be cool in colder climates after we move, with leggings! Can't wait! Before I go, Layla snapped this photo of a cardinal at golf today! So pretty. 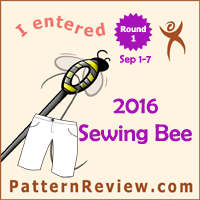 I entered the Pattern Review Sewing Bee! Patternreview.com is having their own version of the Great British Sewing Bee again this year (if you haven't heard of the Great British Sewing Bee, run, don't walk, to YouTube and binge watch, you will love it!) I didn't enter last year because I didn't feel like I had time to participate, but this year when the first challenge (shorts or capris with a closure) was announced, I knew I could fit that in. It doesn't hurt that I can always use more shorts living here AND that I wanted the chance to perfect a shorts pattern. I used the Chi-Town Chinos pattern by Alina Design Co. I love supporting a fellow military spouse and that is made super easy when she produces such a stellar pattern! For reals, I love this pattern. I don't have a lot of fabric options at my local store here, but I went in hopeful that I'd find something. I didn't want to use denim for this pair, but I wasn't liking any of the cotton twill colors. I settled on this linen. In the store, I thought it was black. In the car, I decided it was more of a charcoal. Once I made the shorts, I realized it's brown. But when I went outside to photograph them, it looks almost purple/brown. Ha! It's magical. Alina's instructions for the zipper fly are on point! I found this vintage button in my big button bin and it's perfect. Pattern Review will announce who gets to move on to the next round on the 13th. Fingers crossed! But, even if I don't make it, I have a great pair of shorts! Every now and then I break out of my style mold and try a new shape. This was one of those experiments and I'm not positive I love it. From the front I like it. I like the pockets and I used the best, softest, prettiest color of fabric. I wish the front were longer, but it'll do. It's the crazy drape I'm not sure I'm behind, though! In this photo it's fine. The problem is that the part the makes the drape actually forms a point. And the point isn't anchored to anything so when I stand up, or have been moving around a lot, I find myself reaching inside the back of the sweater and pulling that point back in where it belongs so it's not sticking out and looking weird, lol! The good news is, I think I can alter it to work. It's a very oddly shaped pattern piece, but that sorta makes it easy to fix this by simply making that point smaller. I'm gonna try it and see what happens. I was chatting with my friend the other day after salvaging a shirt I was making that old Nikki would have tossed rather than rip the collar out of to start over, and I realized how much living where fabric is not so accessible and not so cheap has really challenged me to make things work and alter them and take my time on them until I love them. Which brings me to something I AM loving! I had made a dress over a year ago, but I hadn't perfected my technique of using a top pattern and extending it into a dress. This resulted in a dress that wasn't very comfortable to sit down in, ha! But the fabric was so great, I loved it, and the fit was perfect on the top! So I kept it in my stash thinking I'd cut it up someday. I pulled it out and cut it into a top with a shirt tail hem (my favorite) and it's getting so much wear now, I just love it. Successful salvaging of projects gives me hope for the crazy-drape cardigan. Any suggestions would be quite helpful! I made a dress over the weekend and I am so excited about how it turned out! I bought these two fabrics, one a woven rayon and one a soft stretch knit at two different places, but when I realized they made such a great match, I wanted to find a dress pattern for wovens with raglan sleeves. Is that so much to ask?? Apparently so, because I could not find what I was looking for. It hit me that I had this amazing Jalie pattern (Jalie 3245) that I've made several times and love and I knew that I could hack it into the dress I was wanting. It turned out amazing! Because this pattern was made for knits and my fabric is woven, I made some adjustments when cutting to account for the lack of stretch and also to create more of a swing style. My method isn't super sophisticated, but it works. Basically, I pivot the pieces out from the fold so it gradually widens the dress all the way down. That's it. I wore this dress yesterday to church and to teach a sewing class and felt pretty darn fab all day! It's so comfortable and I'm very proud of how my neckline turned out, I think it looks pretty great if I may say so myself. This Jalie pattern is actually how I landed on my favorite method of applying knit neckbands a few years ago and it's the only method I ever use now. And these pockets! These are part of the pattern and I went ahead and cut them out, thinking I probably wouldn't use them. But I pinned them on and asked Natalie her opinion and we both decided they sort of make the dress! It's pretty unusual for me to make or wear anything with sleeves these days, but as we only have about nine months left in Hawaii, and chances are we'll move somewhere with some degree of weather variation next, I'm starting to think ahead to that just a little bit. Although, when I'm stuck in traffic or have to turn around and go home because I can't find a parking spot some place, I start thinking ahead more than just a little bit. Ha! The back fits nicely too. We tried to take outside pictures, but the wind (and my hair) was not cooperating. Casey is so patient to take photos for me. Last time I had my nine-year-old do it, the grass behind me was in perfect focus while I was a blur in every photo. I have enough of this beautiful lace left to make some other small things or parts of things. I love the color and am glad I snatched it up even before I had plans for it!